Osborne has won two hard-fought contests at home against Madison and Marais des Cygnes Valley in the last two weeks. This game is a rematch from Week 7, a game Osborne won 80-32 and set a season-high for points scored. The Bulldogs lead Kansas with 662 points behind the 1-2 punch of 1,000-yard running backs Kenton Ubelaker and Maverick Lerock. Sophomore quarterback Jake Tiernan has completed 85 of 104 passes for 1,353 yards for a 23/4 TD/INT ratio. Clifton-Clyde, back in the playoffs for the first time since 2010, last played in the sub-state game three times from 2007-09 and advanced to the state championship in 2008. The Eagles, led by senior back Caleb Gelino, ranks third in the classification with 576 points. Clifton-Clyde is going to score points, but Osborne is going to tally more. Osborne, after going 0-2 in sub-state championship games in the last three years, makes its second all-time state title game. The Bulldogs won the 3A title in 1983. Hoxie has enjoyed the team’s best season since a state runner-up berth in 1981. Last week, the Indians’ defensive front shut down Kiowa County running back Trever Powell en route a 38-8 victory. 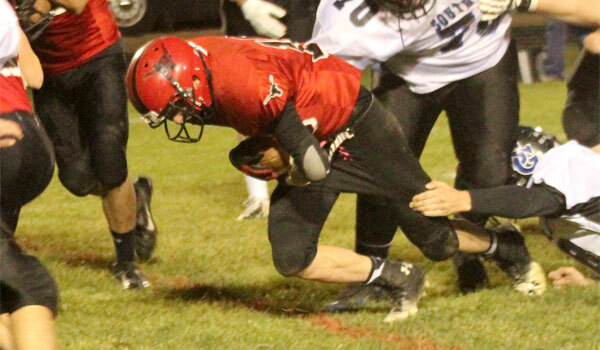 Hoxie stayed disciplined in their assignments, filled well and held Powell to 37 carries for 194 yards. Senior Chase Kennedy returned an interception 50 yards for a score. On the offensive side of the ball, Kennedy has 928 rushing yards and 609 passing yards. Junior running back Connor Katt has 1,905 all-purpose yards (1,516 rushing) and 26 rushing scores. Hodgeman County has outscored teams 530-132 and rank No. 1 in scoring defense. Hodgeman County led 22-14 at halftime and earned a strong 44-36 victory against Central Plains. Alex Kreger paces the Longhorn offense with 1,557 yards rushing and 28 touchdowns. He ha also passed for 632 yards and seven scores. Kolt Washburn has added more than 800 yards rushing and seven touchdowns and Robbie Carter has contributed 466 yards on the ground and nine scores. The Longhorns defeated Hoxie, 50-12 in the first round of the playoffs last season. This time, Hoxie has too much offense and experience and earns the road win.